Here’s one of the more unique pink products for breast cancer awareness. 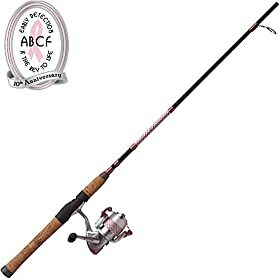 It’s the Shakespeare Ladyfish Spinning Combo , a fishing pole which benefits the American Breast Cancer Foundation. The rod and reel combo is a lightweight set perfect for family fishing trips. Even though it’s lighter than heavy-duty fishing poles, it still hauls in the feistiest freshwater fish. The rod is a 2-piece rod which measures 5 feet, 6 inches. The reel is a 2 ball bearing, one way clutch 30 size reel with 6 pound line. A portion of the proceeds from the sale of this combo will go to benefit the early detection of breast cancer.